Join Us for a Full Day of Celebrations for Lord Balarama's Appearance Day with HH Gopal Krsna Goswami! ~ The Toronto Hare Krishna Temple! Join Us for a Full Day of Celebrations for Lord Balarama's Appearance Day with HH Gopal Krsna Goswami! We are gearing up for what will be a full day of festivities at Toronto's Hare Krishna temple as we celebrate Lord Balarama's Appearance Day! 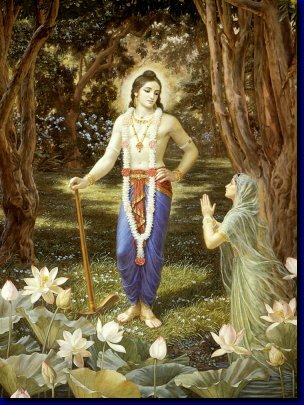 Lord Balarama is worshiped as the older brother and best servant of Lord Krishna. Festivities will begin early in the morning as our special guest for the weekend, HH Gopal Krsna Goswami, will be giving a morning class and then conducting an initiation ceremony. Spiritualists who take to the Hare Krishna tradition can formally take vows from a spiritual master (guru) and this ceremony is known as "initiation". It's a wonderful ceremony, accompanied by a fire sacrifice, discourse and then the initiates are given spiritual names! 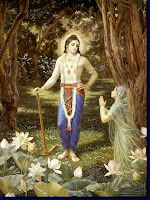 Following the initiation, there will be a special abhiseka ceremony of Gopal Krsna Goswami's Krsna-Balarama silas. An abhiseka is a bathing ceremony wherein deities are elaborately bathed with various items like water, milk, honey, etc. This is accompanied by resounding kirtan! The kirtan will lead into a delightful vegetarian feast (prasadam). The festival doesn't end there, though! The evening festival will kick off at 6pm with kirtan and will feature a special, extended class by Gopal Krsna Goswami. After the class, Toronto's Hare Krishna temple will present the Second Annual Balarama's Bake-Off! Five members of our community have been selected and have been assigned secret ingredients and have been challenged to come up creative sweet items related to Lord Balarama. After the class, the contestants will present their offerings in a fun and creative way. You won't want to miss it! Festitivies will conclude with more kirtan and a huge vegetarian feast! 7:40pm to 8:00pm - Second Annual Balarama's Bake-Off!